Fans of the sleeper hit "Samoan Wedding" can meet Oscar Kightley, the screenwriter and one of the stars of the comedy set in the Auckland, New Zealand, Samoan community. » Tomorrow: He leads a master class on screenwriting and acting for the University of Hawaii-Manoa's Academy for Creative Media, 10 a.m. to noon at the Shidler College of Business, Room C-102. » Tuesday: A screening of "Samoan Wedding," 7 p.m. in the UH-Manoa Architecture Auditorium, followed by a Q&A with Kightley. » Thursday: Kightley talks about his work, 3 p.m. in the East West Center's John A. Burns Hall, followed by a reception. Chef Alan Wong is inviting some unlikely guest chefs into his kitchen on April 15 to celebrate the 12th anniversary of his King Street restaurant. Joining at cooking stations at the "Share Your Table" pupu party will be business leaders Greg Gomes of Advantage Webco Dodge Hawaii, Charlie Higa of Zippy's, Alton Kuioka of Bank of Hawaii, Duane Kurisu of AIO, Deena Nichols of Macy's and television news anchor Pamela Young of KITV. The idea, Wong said, is to explore family traditions through the universal language of food. "Things happen when the family shares food at the table together," he says. The menu will include Higa's wife's Oriental Chicken Noodle Soup and Kuioka's Chicken Hekka, as well as "Wong Way" twists on island favorites such as Lobster Corn Dog (lobster sausage dipped in waffle batter and fried) and Ham Steak Aloha (Kurobuta pork chop with pineapple). The pupu party runs from 5:30 to 8:30 p.m. at Wong's second restaurant, the Pineapple Room in Macy's at Ala Moana Center. Tickets are $125, to help fund the building of a Hawaiian hale at Hawaii's Plantation Village in Waipahu. Call 949-2526. 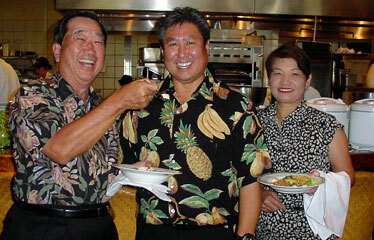 Alton Kuioka offers Alan Wong a taste of the Chicken Hekka that he and wife Susan will serve at "Share Your Table." Brasserie Du Vin hosts a wine dinner, "Central Coast & Languedoc," featuring wines from the Languedoc region of France and coastal California, at 6:30 p.m. April 9. Chef Scott Nelson's menu includes Grilled Swordfish with Marinated Alii Mushrooms (with Qupe Bien Nacido Cuvée), Pan-Roasted Sweet Breads ala Meunier (with Hanzell Vineyards Chardonnay and Ancien "Red Dog Vineyard" Pinot Noir) and Baked Brie in Puff Pastry (with Domaine Cazes "Tuile" Riesaltes). Cost is $70. Call 384-7709.